I had a friend ask me to make cupcakes in an ice cream cone about three years ago. I resisted for some reason, but stumbled across organic ice cream cones and sprinkles at Whole Foods and thought, why not. Being my first time and all, I was expecting to learn some lessons. I imagined balancing the cones would be an issue, but in fact that wasn’t a problem at all. I was also concerned with the wet batter breaking through the cone. That did happen a little, but not too much. What I should have been careful of, however, was overflow. I had significant overflow on all but three of the cones. I was able to scrape the cake off, but it did leave a smudge mark. My recommendation is to leave a good half inch (if not three-quarters of an inch) between the batter and the top of the cone. What a great idea, Chockylit! Thanks for sharing it. So cute. I remember them from a friend’s party in like 2nd grade! as the above poster said, i ate these as a kid! i thought they were so neat. i doubt they were as good as yours. or organic! i got some bunches of lavender to try your recipe for the lavender creme cupcakes. wish me luck! These are too cute! Thank you for sharing your recipe and techniques. Did you have to put the cones in muffin holders so that they stood upright in the oven. AND how did you transport them to your friend? Violet, good luck with those! The lavender cupcake recipe is one of my new favorites. Golightly, I stood them on a cookie sheet and carefully lifted and placed the cookie sheet in the oven. That worked fine. They don’t move or shift in the oven. As far as transport, they were in the little mini-cupcake plastic container and in a box. The sides of the container weren’t high enough and the cupcake cones kept falling on one another. The buttercream frosting was fairly stiff, but did get a little smushed. I am thinking long cardboard strips between each row would work… There is definitely room for improvement as far as cupcake travel containers go. My Mom used to bake these for my birthday! It was one of her two special cupcakes! The other one had chocolate pudding in the middle. Thanks Chockylit! I am the “friend” she is talking about and the cupcakes tasted great and looked beautiful. After I had mine, the tray went on a desk at work and they were gone in minutes. I can also vouch for the lavender and chili chocolate cupcakes! God… If only you did mail order! When I was about 12, I brought a batch of these in to my classmates at my birthday. Obviously, they were a huge hit. You can’t get a cuter cupcake. Ooh, these are the prettiest things! I’ve been wanting to try these out for the longest time. What’s it like to eat? Does the cone get in the way? And yes, do you bake the cones in a muffin pan or do you stand them up on a baking sheet? I made these for a niece and nephew a couple of years ago. So cute, and they were a huge hit! Thank you, your post was very timely. I made these adorable cone cupcakes for my 5 year old niece’s birthday party. But I did run into a little problem, my cone weren’t crisp when I got to the party. I made them in the morning & the party was mid-afternoon. Has anyone else ran into this problem? Wow. What a gorgeous idea! I love it! 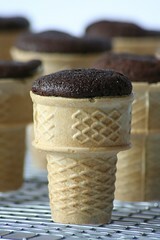 I found this recipe from Betty Crocker for making these cupcake cones. Their recipe calls for placing the batter into a cupcake liner and placing the cone upside down. I will have to try both ways. A creative twist on the traditional birthday cake. Kids will love eating their cake in a cone instead of on a plate! 1. Heat oven to 350ºF. Place paper baking cup in each of 24 regular-size muffin cups. 2. Prepare cake mix as directed on package–except fill each cup 2/3 full of batter (1 heaping tablespoon each). Place ice-cream cone upside down on batter in each cup. 3. Bake 15 to 20 minutes or until toothpick inserted in cake comes out clean (cones may tilt on batter). Cool completely, about 30 minutes. Remove paper baking cups. Frost cake with frosting, and decorate as desired. Stir 2 tablespoons Gold Medal® all-purpose flour into cake mix (dry). Bake 25 to 30 minutes. 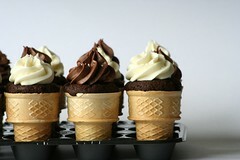 I tried making the betty crocker version of these cupcakes and it made the cones kind of chewy. Is that supposed to happen? How do I keep the cones crunchy? wow! this is very innovative and creative. I am getting into cupcakes of late and might just try this out. Thanks! 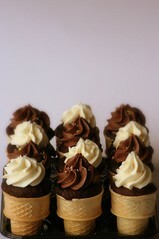 Hi, it’s more than 2 years since this post was 1st posted and i’d like to say thanks for giving me the inspiration that i am looking for, for x’mas this year =) i’ve decided to try these ice cream cone cupcakes out, but seriously having some trouble on how to bring them out and present as gifts. Probably will have to look for little plastic/glass cups to hold the cone, but how to cover/wrap up the swirling cream w/o it losing its shape will be a major deterent to whether i can get it done by x’mas… any ideas, anyone? It looks like a lot of frosting is needed to create that ice cream look – is the result too sweet? If it is any suggestions for getting the cone look but minus the sweetness? A delicious smooth & creamy frosting that can be piped on: 1pkg (4 serving size) instant pudding – any flavor, 1/4 cup confectioner sugar, 1 cup cold milk, 1 8oz container of Cool Whip – thawed. Combine pudding mix, confectioner’s sugar and milk in a small bowl. Beat slowly with electric mixer until well blended, about 1 min. Fold in Cool-Whip. Immediately pipe or spread onto cooled cup cake. Store cup cakes in refrigerator. Hi, thanks for your amazing site! These cupcakes are such a novel idea- when I saw them yesterday I had to make them immediately. I made a great batch tonight and we put a big scoop of ice-cream on top instead of icing and they were delicious- would be great as a choc-top too! I baked a batch for my daughters 1/2 birthday and it turned out fine. that is what I thought, as they started to cool the cone got kind of soggy on the inside. i was wondering what mistake I was making? How do the cones not burn ? crazy !